Dubai: The world’s tallest tower, Burj Khalifa, is celebrating the momentous visit of Pope Francis in the UAE by lighting up with a special logo that represents inter-faith relations. 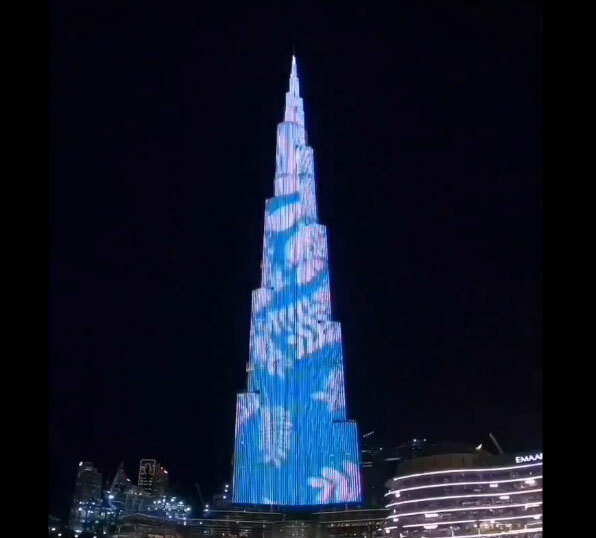 In a video posted in social media, the skyscraper is shown illuminated in blue and white, some of the dominant colours of the emblem for the Global Conference of Human Fraternity. During his speech, the pope spoke of the event’s logo which depicts a dove with an olive branch. “It is an image that recalls the story – present in different religious traditions – of the primordial flood,” the pope said. The logo that pope spoke about was shown on the Burj Khalifa tower during a few-second lights show on Monday night, along with the hashtag: HumanFraternityMeeting. “Burj Khalifa celebrates the historic visit by Pope Francis, the leader of the Roman Catholic church as part of the Human Fraternity Meeting; a visit that reiterates UAE’s embodiment of the values of love and tolerance as the pathways for peace and security” a post on the tower’s official Twitter account reads. Emirates Post also announced on Tuesday that it has issued a commemorative stamp to mark the Human Fraternity Meeting held in the UAE capital. The commemorative stamp is decorated with the picture of the two prominent religious figures, Pope Francis and the Grand Imam Dr. Ahmed Al-Tayeb Shaikh Al-Azhar. “The historic visit of His Holiness Pope Francis and His Eminence the Grand Imam Dr. Ahmed Al-Tayeb spreads a message of love, tolerance and peace around the world and aims to establish our homeland as the global capital for tolerance and coexistence,” said Abdullla Mohammad Al Ashram, acting group CEO of Emirates Post Group. “We are proud to issue this commemorative stamp as a testimony of this visit and to show our pride in our nation’s experience and long legacy of peaceful co-existence. We aim to highlight its efforts to build bridges of communication and harmony amongst different religions, creeds and races, to promote world peace and tolerance,” he added.